Welcome to the Northern Illinois University Department of Geography blog pages! Refer to these pages to stay abreast of past, present and planned activities within our Department. For more detailed information concerning our history, degree programs and faculty, please visit the NIU Department of Geography website. NIU Geography seniors, Michaela Friedrichova and John Trishcan presented their research at the Illinois GIS Association (ILGISA) fall conference held at NIU's Naperville campus on October 6. John's presentation concerned Estimating the Volume of Excavation of Martian Valley Networks. He used Black Top Hat transformation, an image processing technique, to extract valley depth from Mars Orbiter Laser Altimeter (MOLA) data and estimated the volume of selected valley networks on Mars. Valley networks are river-like features on Mars that may contain important information about past climate and water on Mars. Estimating their volume can help determine the amount water needed to form them and the rate of erosion. This was the first professional presentation for both Michaela and John and they learned a lot from this experience. They both have been working with Dr. Wei Luo since this summer. 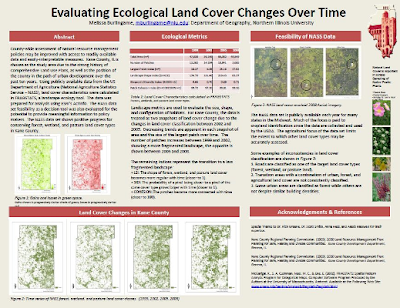 Melissa Burlingame, an NIU Geography graduate student, won ILGISA's People's Choice Award for her the poster she presented, entitled, Evaluating Land Cover Changes Over Time. Melissa's research examines how county-wide assessment of natural resource management policies may be improved with access to readily-available data and easily-interpretable measures. Kane County, Illinois was chosen as the study area due, in part, to its rapid urban development over the past decade. Publicly available land cover data from the US Department of Agriculture (National Agriculture Statistics Service –NASS) were used together with FRAGSTATS, a landscape ecology freeware package, to examine land cover changes and evaluate the degree to which these analyses may inform conservation policy decisions. Melissa's preliminary findings suggest that Kane County has made progress toward conserving forest, wetland, and pasture land over the study period. Congratulations NIU Geography students on your impressive work! Observation is often the first step toward understanding in science. 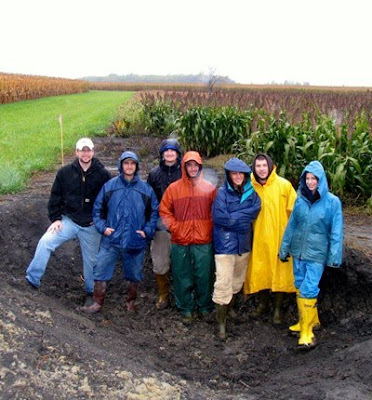 For student members of NIU's Soil Judging Team, observation is also the key to determining the nature of a soil, how it formed, what types of vegetation it can support, how well it drains, and its ability to safely bear homes, buildings, and roads. 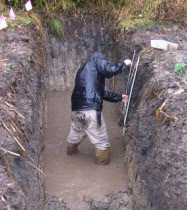 For the third year in a row, a team of students from Northern Illinois University competed in soil judging against teams from universities in Illinois, Indiana, Wisconsin, and Michigan and, for the second year in a row, NIU's soil judging team demonstrated their outstanding skills in observation and interpretation. NIU's team of TJ Abell, Clint Bailey, Aaron Browning, Paul Gruca, Amber Singer, and Norman Yackle placed second overall in the Region 3 Soil Judging contest held in early October near West Lafayette, Indiana. Two of the team's members medaled in the individual competition, with Aaron Browning placing second and Clint Bailey placing fifth. This year's Region 3 Collegiate Soils Contest was hosted by Purdue University and the Indiana Association of Professional Soil Classifiers. 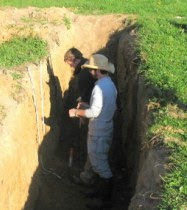 By virtue of its second place score, NIU's Soil Judging Team is eligible to compete in the 50th Anniversary National Collegiate Soils Competition to be held in Lubbock, Texas in March 2010. Congratulations! The NIU Soil Judging Team is coached by Dr. Mike Konen, Associate Professor of Geography, and Alicia Lisowski, MS-candidate in Geography. Our undergraduate programs include B.A. and B.S. degrees in geography as well as a B.S. degree in meteorology. The B.A. and B.S. degrees in geography offer students opportunities to develop greater spatial understandings of a variety of social and environmental phenomena. And with the proper selection of elective courses, students can meet federal civil service qualification standards and/or earn certificates in GIS or Homeland Security. The Department's B.S. degree in meteorology was the first atmospheric science degree program offered by a public university in the State of Illinois and is one of the largest programs in North America. More information about this program can be found at the NIU meteorology webpage and the NIU meteorology blog. For individuals seeking graduate education, the Department offers a Master of Science degree program with specialization in natural environmental systems, urban/economic geography, or geographic information science. The mission of the M.S. in Geography is to provide a quality graduate education that prepares students to contribute to society in roles as scientists, analysts, managers, and educators. We are also in the final stages of developing a Ph.D. program in Geography which is anticipated to begin fall of 2009. The Department offers a broad range of courses across several thematic areas including geographic information systems (GIS), natural environment systems, urban/economic systems and area studies. Refer to the Department web page for the geography-specific undergraduate and graduate course schedules and a list of online courses we offer. Producing meaningful academic work requires a knowledge of literature in one's field of research. Below is a list of peer-reviewed articles recently published in journals that are of interest to NIU Geography faculty and students.